We plant companionably and we plant companion plants. Now there is a mouthful for you. A recent visitor to the garden was quizzing me on the bright orange and yellow flowers putting on such a good show. 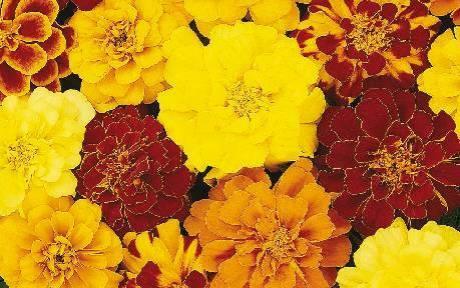 Are they marigolds? Calendulas? Mmm, I'm not sure I answered but I am sure they were planted to be companions to some other plant. They might have been planted to deter some of the nasties which decide they want to eat our hard won vegetables. So a little investigation led me to this pagewhere the flower certainly doesn't look anything like the ones in the garden. So I searched further. This site has a few more photos of different marigolds but still not one resembling the flowers in our garden. Now move onto calendulas and see if this is what we have. Ah, the photos here look much more like what we are growing and they still have properties which control sap-sucking insect pests (such as aphids, thrips and whitefly). 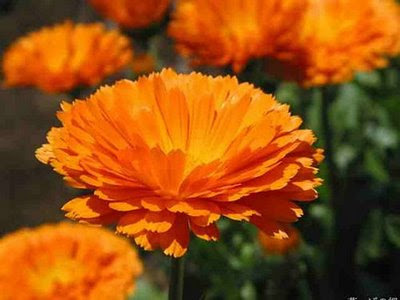 I like the tips about hanging the dead flower heads to harvest more seeds for next year when I will be able to talk with much authority about the calendulas and the pests they deter. We plough and we scatter! Won't be around this weekend to check on the lush growing space, otherwise known as our Community Garden, so I will muse on the goings on this week. Sunday saw Mr Ideasman scrambling over the strategically placed barbed wire affectionately guarding our own Gulag as the key was missing! I think that Ms Mova had been up early and not being quite awake had left the key in the garden. As she had beetled off down to Sydney for a family birthday gathering, we resorted to carting along two ladders and up he scaled. Ms Tagalong was glad she was there to shout out warnings as the barbed prongs threatened her upcoming nuptials! The lushness of Spring is around the corner and seedlings are asprouting as are the weeds. A cautionary tale: please look carefully at marked seedlings before plucking out the offending weeds. We all cherish our seeds we plant and like to admire their growth and then plant them out. Sometimes people remove them by mistake and that is all part of being in a community garden but those who have marked their seeds need to be applauded and noticed! Poor Ms Mova looked long and hard for a stevia plant and now she will be looking longer and harder because although the plant marker is there in all its multicolour plastic glory, the plant isn't! Another victim of an enthusiastic weeder perhaps? There are a lot of toilet rolls in the potting shed. Someone has been busy! Many seedlings have been replanted in these to be able to sell on to raise money at the garage sale in October. Wonderful, biodegradable, you just plant the whole lot! So if you are looking for a job in the garden please make sure these are kept moist at all times as they will dry out pretty quickly. So the manure story goes on- we are now encouraging the growth of our youngsters by letting them shovel the lovely stuff into barrows. I swear they were taller when they finished! I received a comment about the toxicity of rhubarb leaves and whether I was pulling people's legs about feeding them to the lovely ladies who are so happily laying these days. Well, actually it seems as though the jury is out. Doing a little research I found some conflicting advice. Considering that the chances of us having any rhubarb to make into rhubarb crumble are pretty remote, I don't think we will worry too much about it yet! Today, our working bee day, was such a glorious day, with so much accomplished and so many happy, smiling faces and laughing children. Thank you to all the contributors and workers. They planted and watered, sawed and bashed apart, rode and ran all day. Good sleep tonight, I feel. Having planted out the fruit trees we have we are still looking for pawpaws and as many passionfruits as we can have! A mulberry would be good too. The roof is on the top tanks and now we need some rain to fill them. We estimated that we used about 100 litres of water today for watering and potting so we will have 2 months water when they are full. Someone mentioned that a wet spring is forecast which would be ideal but when has a gardener's life been easy? So a lovely salad of mixed greens, radishes and tomatoes together with some muffins made with spinach and dill from the garden were consumed for lunch together with a disappearing stash of Mr Ideasman's Anzac biscuits! I shall have to make some more! Okay, okay they were storebought. Community centres come in all shapes and sizes and we think our garden is a good one! With plans afoot for a movie night, a music night and a possible long table meal we are bursting with good ideas as well as good produce. Little Miss Pretty was spotted eating baby broad beans straight from the pod. She who never touches greens at home! So for those who liked the muffins, here is the recipe link courtesy of Taste. Sitting having a cup of tea and congratulating ourselves on a day well done we were asked for some dill by two teenage boys, Ms Tagalong, who prides herself on knowing everything gestured behind her and the dill was picked. A few minutes later they returned saying, no they thought that might be fennel. Closer inspection found the dill plant but I thought it was interesting how alike they are and what are the differences besides the smell of course. So are you wiser now? I am not sure I am and feel that I can be excused for confusing them, so perhaps Ms Tagalong doesn't know everything! What shall we make tonight? There is no finer pleasure than wandering into the garden after work, looking for inspiration and fresh produce. I purchased two lovely Greek spinach and cheese pies at the Olive Tree Markets and served them with a range of lovely greenery. Curly, pale green lettuce, shiny purple lettuce, coriander and parsley, feathery mustard green, slices of the largest radish in the universe topped with the smallest tomatoes you have ever seen. Olive Tree Markets is held at The Junction Primary School and Ms Tagalong was glad to see the productive veggie garden in the middle of the school grounds, as you can see in the photo above. She was also very jealous of the healthy rhubarb crop you can spot in the bottom left living happily in an old bathtub. If you have been paying attention, dear reader, you will know how Ms Tagalong covets a good crop of rhubarb. Mmmm rhubarb crumble and custard must be one of the best desserts ever. Back to the garden, we are getting ready to start planting some fruit trees in the chicken run and maybe out on the verge. Waiting in readiness are a tamarillo, a Davidson Plum, a fig and a lilly pilly. We would like some native raspberries, pawpaws, mulberries and any other luscious fruit tree anyone would like to donate. The Davidson Plum was donated by the wonderful Ngioka Centre in Nelson Bay. They have a great range of native plants for very reasonable prices, so if you are walking behind Little Beach glance up and take a look. Glancing down instead of up last week I noticed the broadcast sowing of seeds such as radish and bokchoy have come up in a profusion of competitive seedlings. Looking for a job in the garden? These need to be transplanted out in some of those lovely manure-enriched beds. Can't wait I hear you say...well there will be plenty of other tasks next weekend to get the garden ready for the growing season, so come one come all and we may even have a treat with one of our number educating us on weeds! For a great rhubarb crumble recipe follow this link. I can't wait until our one remaining rhubarb clump has the required ten stalks! I don't think the girls can either, apparantly they love rhubarb leaves or is that for compost? I think they love anything you give them judging by the clamour at the fence in the morning. Feeding frenzy!